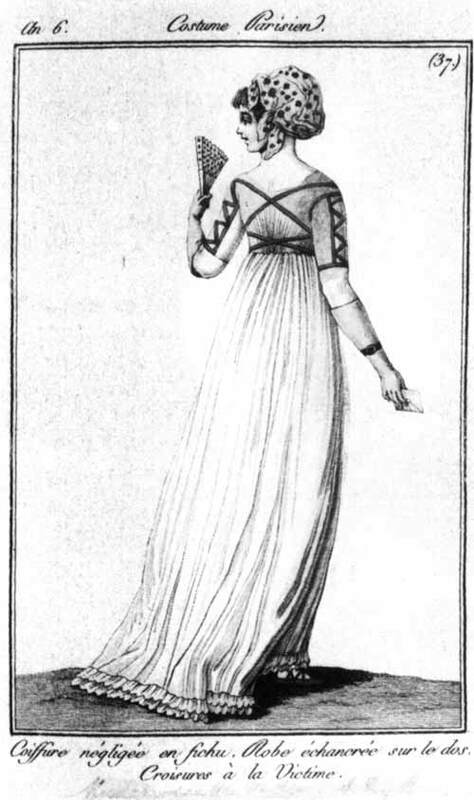 As for the fichu (used as a head scarf in this case), she read further: “it’s tied in the back, its color is sometimes green, sometimes violet or poppy red, sky blue or daffodil. They particularly like it with taffeta or flowers, especially artificial flowers often in unnatural colors.They often have “velvet embroidery” aka they explain it’s velour applique in oval shapes often sewn to the edge of the fichu and to which you add sequins. The color of the velvet is almost always black. … They also added that some women instead of the fichu choose to wear a spiral turban, like the ones from Algeria, with pearls and rhinestones and things that reminds of oriental luxury. They do mention that this fad is starting to die.” Those do sound like lovely colors, but all I’ve got is a golden brown sari so that’s going to have to do. I was able to recycle my old La Mode Bagatelle bodiced petticoat by removing the skirt and putting it on a new (cough, larger) bodice, and I found some nice white dotted lawn at my local $2.99/yard fabric outlet. I may need to piece it a bit but I can live with that. And I already have the American Duchess regency shoes, and some fingerless gloves I made from silk taffeta ages ago, so my biggest expense with this outfit is actually the 10 yards of silk ribbon I just ordered from M&J. Ordinarily I would raise the back neckline to help cover my very modern tattoos, but since a low back neck is part of the “certain attraction” here, I won’t, and likewise will keep the décolletage slightly more covered in deference to my matronly age. 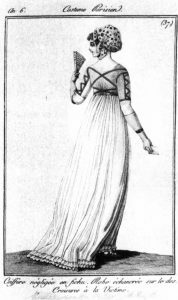 I’ll use a simple 2-drawstring back closure as this seems to have been more common on dresses of this period than the back-buttoning closure popularized by the 1995 Pride & Prejudice. I’m not yet sure how to attach the bodice ribbons; they must be stitched down somewhere but I don’t think it will work if they’re sewn down all over like the sleeves will have to be.